Many of you already know them, some of you are probably still afraid of them - Czech census records. They are available online for some of Czech archives - right now only those which cooperate with FamilySearch. Where can you find them? What those records contain? Is information in them correct? I'll try to answer these questions. First of all, a bit of historical background: First attemps to create census for whole population of Hapsburg monarchy took place during the reign of Empress Marie Terezie (1740-1780). First census took place in 1754 but was very inaccurate. It resulted in a conscription patent which was issued in 1770 - regular censuses were in place after this patent but they were just summaries for villages and towns. These records were improved into new census in 1843 and 1857 - these were two attemps to create modern census as we know it today. They had many flaws, one of them was that it didn't show those people who were really present in place, but just those who belonged among "domestic" people - servants were counted as domestic in villages they were from etc. 1910 Census of Olešná near Havlíčkův Brod. Stored in district archives in Havlíčkův Brod. First modern census took place in 1869. The law estabilished 10 years period for censuses - second one took place in 1880, then 1890, 1890, 1900 and 1910. Census in 1910 was the last one which took place in monarchy - next one, in 1921, already took place in Czechoslovak republic which was created in 1918. Then the next one was in 1930, another in 1950 etc. Censuses from 1869 to 1921 are stored in district archives. 1930 census is stored in the National Archives in Prague and is accessible to direct relatives only. Right now only those archives which cooperate with FamilySearch have their censuses online - ie. district archives under Litoměřice, Opava, Třeboň and Zámrsk regional/land archives. It covers number of district archives and most of the censuses are published on the FamilySearch website. 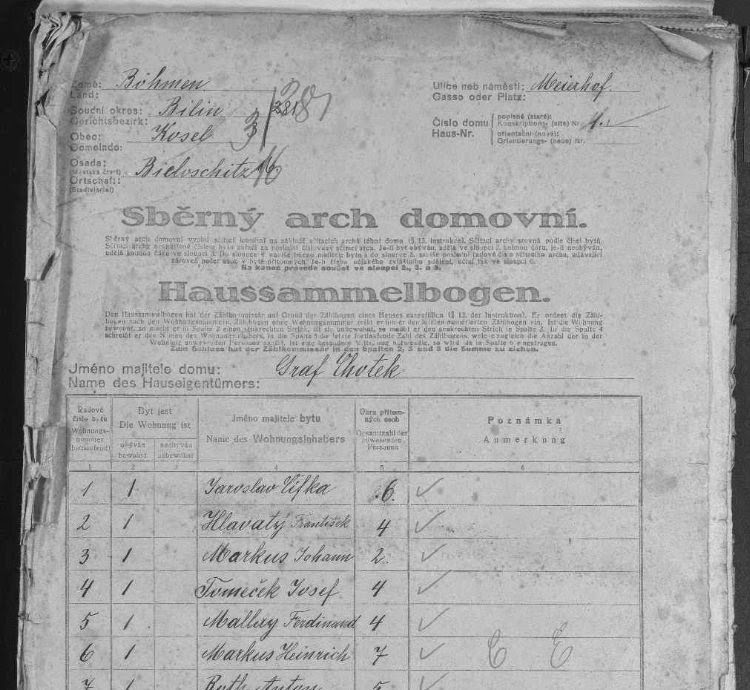 Some of the censuses are also published on the website of archives - Třeboň is well-known and user-friendly. Another is Zámrsk which is quite problematic - it's only in Czech and the website is not providing easy guide to the censuses. It's better to search on FamilySearch website than on Zámrsk website. Litoměřice archives website is currently down but they are preparing censuses in their own system. Now we come to one thing that could cause huge problems. Censuses for Litoměřice region are not divided on clasic district system as we know it today (76 districts plus the capital Prague) but on old court district system. There were many more districts those days - and it's not so easy to find out under which the village belonged. Litoměřice archives provide lexicon of villages in northern and north-western Bohemia. It's available in English so it's easy to use. Important information for the census is in the column "court district as of 1930" - it's the district you should choose on FamilySearch website. Other archives are available on current district system so you just have to know which district the village you are searching for belongs. Censuses are divided by village and them by house numbers. The best way (of course) is to know the house number you need. FamilySearch has strange system of naming the archive records but there is one thing you should know - two last numbers of the census archive number on FS website are house numbers. This example is for Bělušice village in Bílina court district and it tells us that the archive number contains house numbers from 1 to 52 (whole village in this case). Believe me - it's better to know the house number when searching larger villages and town because there are no indices for the censuses and you'll most probably need to go page by page to find your ancestors/relatives if you don't know the house number. And it sometimes means hundreds of pages. First of all you'll get "Sběrný arch domovní" which contains overview of the house - who is the owner of the house, who are flat owners, how many people live in which flat etc. Then you get records for houses. The house number is written in the top right corner of the census, each sheet is for one flat - one house could contain more than one flat, there were five or ten flats in large houses. Flat owners name is written in the center of the description (marked by large red "circle" on the image below). What do the census sheets contain? What information can be gathered? Is it correct or incorrect? What about people who lived somewhere else than where they belonged? These (and probably some more) questions will be answered in part II. - content of the censuses. Thanks Blanka for part I, looking forward to part 2! Are the 1930 census for Ceske Budejovice aswell as Melnik stored in the National Archives in Prague? Thank you for this great blog, always very helpful and interesting. Yes, all census sheets from 1930 are stored in the National Archives in Prague. But it's not accessible to public, there is request-based research done in the 1930 census. Blanka, thanks very much for all the new posts the last couple of months! I have a question about the censuses. You said that for 1869 to 1921 they are the district archives. What about 1843 and 1857? If any of my ancestors were counted by a census it was 1843 and maybe 1857 for some of them. Those older ones are also in district archives, but as I mentioned below, there are quite few of those sheets still existing. I found your guide very helpful but I am confused now. I tried what you said above about the "house number" to narrow down the right search in Familysearch.org and it does not work for me. My ancestors presumably lived at 14 Elizabeth Str, Gablonz an der Neiss (Jablonec nad Nisou). So I went to the books per the house numbers and looked for house 14 and it did not match. Are the books divide further which I do not understand? There are over 25 books with over 300 pages.... I hate to view every page if I do not have too. Is there somewhere else to see the pages then through Familysearch? Its just so slow turning page to page via thier site. Thank you in advance and thank you for a helpful site! It's always complicated in large towns as there were too many houses. Street number didn't always correspond with the house number in the census. Also many towns were divided into smaller quarters which complicates the search. Do you have some more information about Elisabeth Strasse? In which part of Jablonec it was? Blanka, your site is great. I know my grandfather was born in Radhostice, South Bohemia. Is there a way for me to find out if I still have relatives living there? Thanks! Thanks, Linda. Well, first of all you have to start with tracing of siblings of your ancestors as well as their descendants. Once you get to the beginning of 20th century, you can try to write an e-mail to Radhostice municipal office asking if there are still living descendants of people you found... A bit complicated, but it often works. How do we know what district to look for? Blanka, what about the 1857 census? Well, as mentioned, it's the pre-modern census - attempt to create a census, but not too successful. Many of sheets from 1857 census were destroyed, but if you are lucky, it could fill in some gaps. Is there a way search online the 1921 census of Prague, particularly Karlin? I am looking for relative named Josef Havel born 1863 in Slating, but was living in Karlin in 1921. Blanka: What was the official dates of enumeration of the 1857, 1869 and 1880 censuses? Thanks!